England are scheduled to play five Test matches in India as part of their long tour which commences with the first Test at Rajkot on November 9. England are scheduled to play five Test matches in India as part of their long Indian tour which commences with the first Test at Rajkot on November 9. England are coming into the series after drawing level with Bangladesh in their backyard. The English were handed an embarrassing defeat by Bangladesh in the second Test at Dhaka.The Brits had narrowly won the opening Test against Bangladesh in Chittagong by 22 runs before losing the second by 108 runs in Dhaka, their first defeat to the South Asian side in 10 Tests. The English would be spending a considerable part of the winters in India with a long tour ahead. England's tour of India comprises of 5 Tests, 3 ODI's and 3 T-20s. The Bangladesh tour would have been a good testing ground for the English to take on India as the playing conditions and wickets were be very much alike. The English batting has a blend of youth and experience. England Test skipper Alastair Cook has been England’s best opener by a mile in the last decade or so. Cook has been a prolific run scorer on different batting surfaces all around the world and has a special liking for the Indian bowling. Cook became the first Englishmen to get to 10000 Test runs and looks good to give Sachin's Test record for most runs a run for its money. 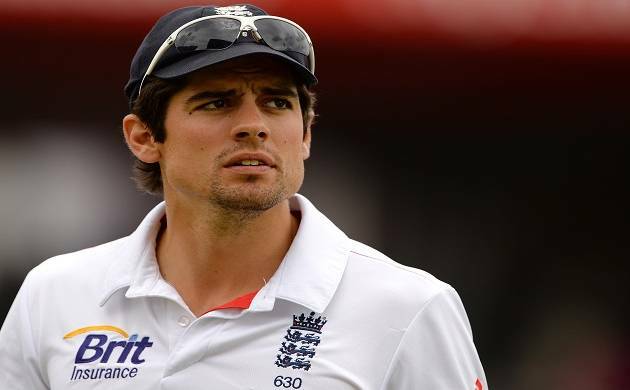 Cook scored a plethora of runs when England played India in the last series. Cook shall once again look to provide his team with a solid foundation upfront. 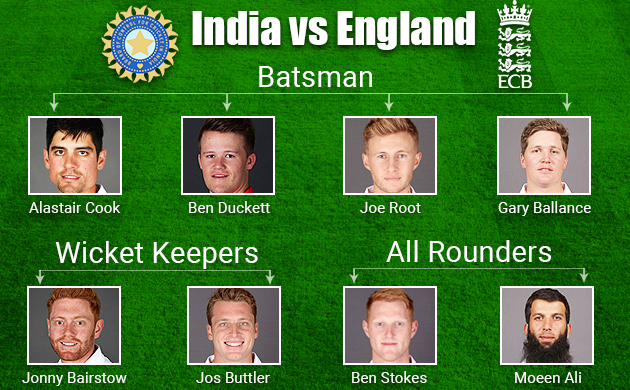 Cook doesn’t have a dependable opening partner at the other end so the selectors have given a chance to Ben Dunkett. The middle order shall revolve around their batting mainstay Joe Root. Joe Root is perhaps their most talented batsman in the longer format. Joe is complete stroke player who is equipped with a solid defence and wide array of shots. He had a steady head and has been often excelling in his role as a run accumulator for the team. Root has been hailed as one of most accomplished batsman in both Test and ODI format. He has a calm head on his shoulders the responsibility as the mainstay of the English middle order. Apart from Root, the English batting looks relatively inexperienced with a couple of youngsters making the cut. Gary Balance has seen bee plagued by inconsistencies and would like to improve on that aspect of his game. The English shall surely miss the services of their seasoned Test batsman Ian Bell who was adept at playing spin. Wicket-keeper batsman Jos Buttler is arguably one of the most destructive batsman who can lend impetus to their batting in the middle order. Butler is an attacking stroke maker who could change the complexion of a match in one session. Jonny Bairstow is an accomplished wicket-keeper batsman with good skills with the glove. Ben Stokes has been their premier all-rounder who lends balance to their side with his in batting and bowling. Stokes would like to compliment the pace attack with his medium pacers.Besides his batting credentials, Stokes is a handy batsman with a well organized technique. The English pace attack shall surely miss the services of their pace spearhead James Anderson. The attack shall be led by the tall and lanky seamer Stuart Broad. Broad would look to exploit any bounce and swing on offer. Steven Finn is the quickest of the paceman and has built a reputation of rattling out top order with his sheer pace. Meanwhile Chris Woakes and Jake Ball have been included as the other seamers in the squad. 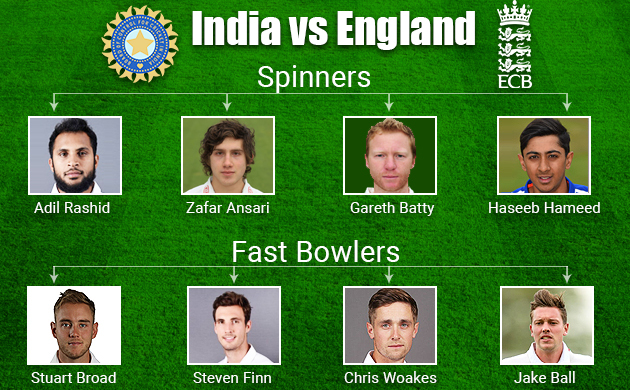 The England spin attack looks pretty potent and had done well in subcontinent conditions. They have variety in their attack with a couple of off-spinners and leg break bowlers. In the absence of a frontline spinner, Moeen Ali has assumed the role of their lead spinner and been consistently among the wickets. Meanwhile leg spinner Adil Rashid has shared the spin attack with Ali quite well. Rashid has an unorthodox action which keeps most of batsmen guessing till the very end. Off spinner Garett Batty makes a return to the English team after a gap of 11 years. Young turk Zafar Ansari included in the squad would like to make an impression of sorts on his first tour.